After releasing a revamped iOS version of its Twitter client in October, Tweetbot on Wednesday debuted an equivalent Mac update that offers exclusive features for OS X 10.9 Mavericks, as well as a number of bug fixes. Tweetbot for Mac hit version 1.4 with the latest release, adding minor usability enhancements to the popular Twitter client. Headlining the changes are Mavericks-only features like smoother scrolling and deeper integration with Apple's Notification Center. As for the latter, Tweetbot notes that users can now reply to tweets and direct messages from the notification pop-up window, much like Apple's implementation in Mail and Messages. The app also tweaked refresh rates for lists and saved searches, which are now checked every two minutes instead of four minutes. Fixes include an issue where some users would se the message "Please enable wifi" when the app fetched locations for tweets, UI problems with timeline searching and a potential bug that would cause a hang when using secondary windows. Finally, the latest Tweetbot addresses "a few issues" for users running the app on OS X 10.7. 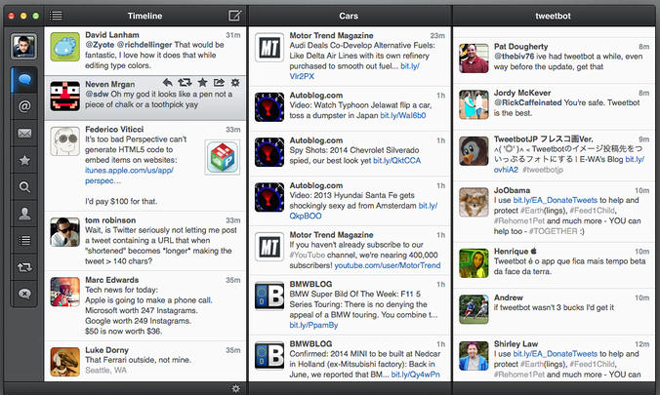 Tweetbot for Mac comes in at 5.3MB and can be downloaded from the Mac App Store for $19.99.